Susan Sontag Animation: Regarding the Pain of Others from L Nordell on Vimeo. Susan Sontag’s animation, with its stark halting stop-motion images and its repetition of all that we (on the outside) cannot know is jarring and difficult to take. There’s something damning about it. 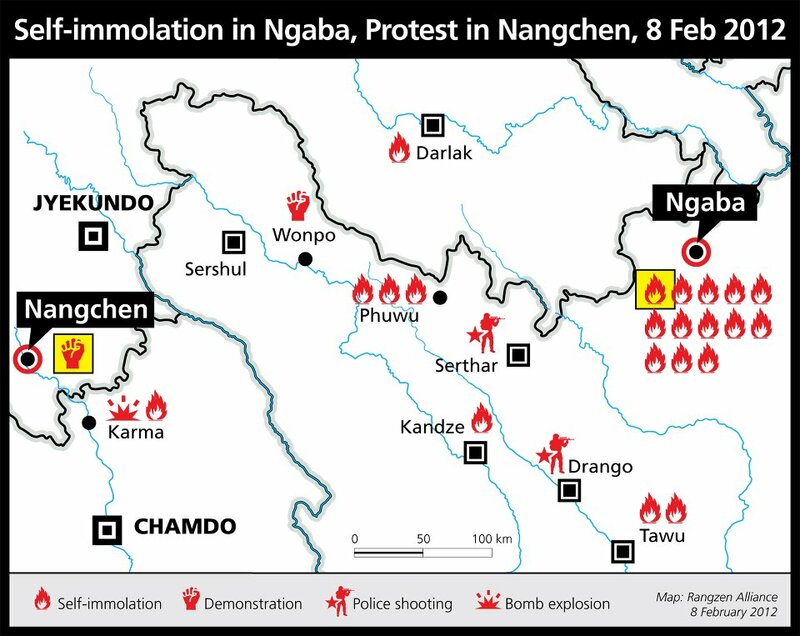 I want to say, “I can imagine; I can imagine something of what’s happening in Tibet, at this very moment.” But I fear that Sontag is right. And more importantly, as Sontag writes, I realize the task is much greater than one of imagining. Back at the end of September, just after Lobsang Kunchok and Lobsang Kelsang were the third and fourth Tibetans to self-immolate in 2011, just as the first horrific images of charred bodies on concrete sidewalks surfaced, I looked numbly through a local bookshop for something to explain things. 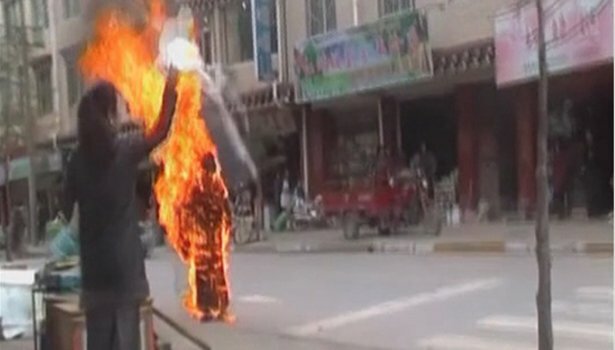 I didn’t want a book to explain the self-immolations or the situation inside Tibet. Those policy oriented analyses would come with time. Instead, I wanted something more elemental. I wanted someone to tell me how I should look at these images, how I should regard the suffering of my own people. 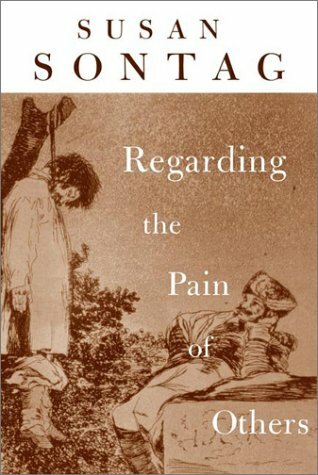 That’s when I came across Sontag’s On Regarding the Pain of Others. This is the 2003 follow-up to her iconic book On Photography from 1977, a book whose essays on the complex ethics of photography are so important that, 35 years later, my colleagues and I still teach them to freshmen at Columbia. In the short book (its pages reaching only 126), Sontag gives the history of atrocity photography. She writes that photography of wars has changed throughout history: where in 1945 it showed the new lows of human evil and despair with images of Nazi death camps, and so acting as a justification of sorts for war, it became a defiant protest against war in the Vietnam War era. After this era, photography faced greater censorship and manipulation — American citizens saw little of the most damning footage of the 1991 Gulf War for example, and more recent examples are numerous. The images that have come out of Tibet in recent months are not the sanctioned products of the dominant power, but defiant and dangerous actions against censorship and tyranny. They are messages released from some tiny air vents into the world. So these photographs, coming from the cell phones and cameras of our fellow Tibetans to our computers and our homes are faithful reports of what has happened, and they are also transmissions of several personal narratives: of what’s captured in the frame, of the person capturing the moment, and perhaps even us viewers who spread the photographs further online. In the act of looking at these photographs, see both the factual longitudes and latitudes, and the lives that surround the objective record. Yet Sontag is not interested in just analyzing what’s captured in a photograph. She wants to talk about the ethical implications of living in a world where, for example, we can see these pictures of monks and nuns on fire, and walk away from our computer and eat a burrito and have a beer with our friends and talk about our own problems. I often have moments where I wonder, how is it possible? How is it possible that I’m browsing movie listings on my Netflix account while Tibetans are dousing themselves in gas and being beaten to death even while they’re on fire? Like many of you, I’ve gone to the protests, signed every letter, told my non-Tibetan friends about the crisis in my country, and yet that question doesn’t go away. How do we face the blood and guts of our pain — and our privilege? It is the last option that is ultimately the only viable one for each and every one of us Tibetans now. We have seen the images, we have heard the stories. And Sontag, were she alive today, would tell us that we can only look and listen to the plight of our people, essentially we can only be Tibetan (for to be Tibetan must mean to see the world of Tibetans intimately), if we act. It is this quote above, near the end of Sontag’s book, that gives me the most insight. For although this was written years before the self-immolations in Tibet, and although Sonntag herself died just after this book came out, she sheds light on the unique (yet not unprecedented in human history) view Tibetans inside Tibet may have on their own suffering and their actions. Whether we understand this view or not, we must respect it, and we must answer in our own way. Like a devout believer, I’ve read Sontag’s book cover to cover thrice now. Eventually its pages will tatter, showing the love and struggle of its faithful follower. And yes, the effort to imagine, to empathize completely with the suffering of others may be inherently doomed to fail. But Sontag reminds me that we must try; for to be alive, to have our eyes and ears open means we have a responsibility to act. Especially when the world shows us its painful truths. Thank you for sharing these illuminating ideas, thoughts and feelings. Thanks RebeKunga! We appreciate your feedback. In my experience, it is pselirecy because photographs do not come “directly to us without human medling” that captivates us so wholely. Matthew Brady, one of the first great pioneers of photo documentary knew this. He would manipulate corpses after Civil War battles in order to create a certain effect. A weapon glinting in the sun, lying on the breast of a fallen soldier with his face turned to the sky spoke infinitely louder than a faceless corpse, no gun near by. The magic in photographs is in their ability to tell the truth a photographer chooses but to appear to tell the whole truth and nothing but. In addition, the lens finds a truth that the naked eye can’t. It’s an endlessly fascinating art form. Yeah, foxes DO know what they’ve done. THIS one needs a slap anyway thuogh because he thinks he was ENTITLED! Penny loafer, pastel sweater tied over the shoulders, white jean-wearing, remorseless puke. Who does he think he is? PRINCE Chuck Norris?